Comprehensive frameworks such as ITIL provide best practices in a context of IT Service Management but do not support the specific tailoring of processes in a practical setting. This problem has been attacked successfully for systematic IT Service improvement at a large telecommunication enterprise leading to a generalized approach for the improvement of IT Service Processes. In order to cope with multifaceted processes within a complex infrastructure an elected approach is necessary: key stakeholders must be identified and Quality Function Deployment may be used to elicit and prioritize requirements effectively. The requirements can be employed to focus the analysis on the most relevant parts of the given framework leading to a focused audit and yielding specific improvement measures. In combination with further analysis as Pareto and Portfolio analysis a well-thought-out solution portfolio could be proposed, dependent on the impact on the solution and the difficulty of implementation. An extensive employment of such a complex framework like ITIL may lead to over-regulation. But which are the most important elements of ITIL for a specific environment? ITIL is a best practice library and does tell what is appropriate but not how to tailor it for a specific context. This question has been addressed within a large telecommunication enterprise, solved with an innovative approach, and validated within a pilot project serving as the case for this chapter. The approach and the project have been devised to lead IT Service improvement initiative within the enterprises in different branches, cultures and countries. The results have been approved with regard to a complex environment which is typical for large IT Service providers based on the experience of the authors. The description of the approach and the case are omitting enterprise-specific details which have been considered to be irrelevant with regard to proven practices to be analysed by scientists or adopted by practitioners. A leading telecommunication service provider in Germany has been experiencing major problems regarding the quality of IT Services Support: a substantial number of major incidents occurred causing strong dissatisfaction of customers. IT Service Support is embedded in a very complex structure and there are several interdependencies between internal and external customers and suppliers. 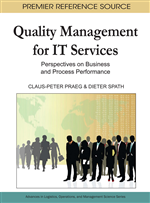 Large effort has been invested into quality and process management since, whereas technical issues, i.e. the implementation of the helpdesk software played a central role in IT Service Design so far. Several initiatives have been undertaken to alleviate service degradations but none had a significant impact on the perception of the customer. Management was searching for an independent analysis of causes and thorough measures in order to improve quality of IT Support Services sustainably.